If you want to go beyond snorkeling and experience the world's underwater beauty in the safest and easiest way possible, try SNUBAÂ®. With SNUBAÂ® you can breath easily underwater without wearing heavy, restrictive dive gear. Discover incredible coral formations and schools of tropical fish as you glide effortlessly under the surface. SNUBA is safe family fun, and it's easy to learn. No prior diving or snorkeling experience is required and the minimum age is 8 years old. After a 15-20 minute orientation during your sail out to the reef, your professionally trained SNUBA guide will personally take you on an underwater tour of the beautiful marine environment. Your Snuba Tour Includes: * Personal guided tour * Complimentary beer, sodas and bottle water * A full hour in the water at the reef * A ride on one of the most comfortable power catamarans in the Keys * All instruction and equipment Our 33 ft. luxury power catamaran gives you a fast and comfortable way to get to the reef in a small group of up to only 12 divers. It is equipped with an easy swim platform, a large bathroom, sun and shade areas, and a fresh water rinse. INFORMATION Times 9:00 â€¢ 1:00 â€¢ 4:00 Winter times will vary depending on sunset times Location Our boat, Miss Sunshine, is located at the Garrison Bight Marina on Palm Ave. between N. Roosevelt Blvd. and Eaton St. The boat is parked in slip # 7. Parking is FREE. Please arrive 15 minutes before departure time. E-mail	info@snubakeywest.com Reservations Reservations are required. You can submit the form below or call (305) 292-4616 or (305) 923-4320. Age & Ability You must be able to swim and 8 years old or older. Some medical restrictions apply (ie. 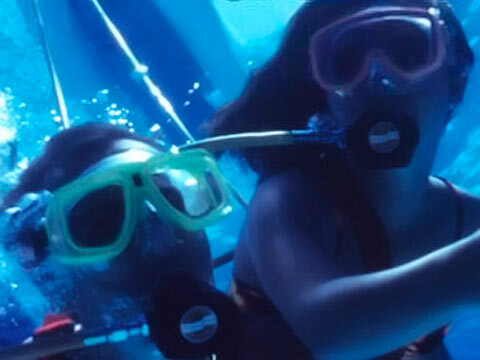 heart conditions, respiratory problems, diabetic, pregnant, etc) Price $99 per person $79 per person for children 8 to 12 years for Snuba $44 per person for non-Snuba snorkeling or rider What to Bring All equipment is provided. Bring a towel and sunscreen.